"Into the arms of Orion," warbled pint-sized pop legend, Prince, on his forgettable Batman soundtrack album. 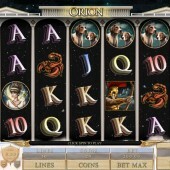 And it's into the arms of Orion you'll be going if you're like thousands of online slots fans who love their games inspired by Greek mythology. Long before he became a celebrated constellation, Orion was a great huntsman from Greek mythology who liked a bit of sport with the goddess Artemis before being taken down by one of her arrows. It wasn’t all bad for our bow-wielding friend, however, as he went on to enjoy a successful career as a constellation. That's not something you can say for other legends of Greek mythology who had a slightly less fortuitous fate! Orion Gives You 50 Pay-Lines! Anyway, here in this Microgaming-powered slot the legend of Orion has been transported into a 50 pay-line game with 5 reels of loveliness but 4 rows instead of the standard three. There are also plenty of stacked symbols to add to the mix. On the reels are Orion himself, his beautiful companion, the goddess Artemis, and his loyal hunting dogs. Betting starts at a friendly $0.01 and it’s just as well considering there are a potential 50 pay-lines on offer. Look out for the Wild clock symbol, as it acts as the game’s Wild, substituting for all regular symbols other than the Scatter. 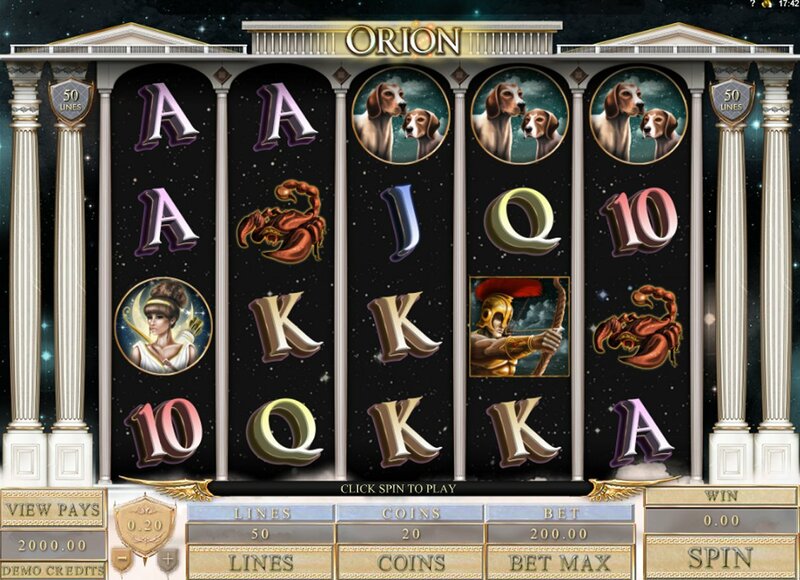 The Scatter with the logo of Orion is a multiplier, so total lines staked and coins played determine the payout from these wins. Three or more anywhere on the reels triggers a bonus game where eight free spins are awarded automatically. But there’s more: each spin can create the ‘Wild Slide’ effect when three more Scatters are landed anywhere, whereby they will align on the reels to become a super Wild - effectively like an Expanding Wild - to add more wins and free spins. 8 Free Spins? Yeah, Why Not! I'm a sucker for free spins, and although 8 spins won't exactly set your world alight, the addition of extra Wilds during the bonus round can certainly pay off if you make them work for you. In terms of other myth-based slots, there's plenty of choice out there, with Bally's legend-themed Cupid and Psyche giving this game a run for its money in the bonus stakes. If you prefer less loved-up slots then give the legendary Zeus slot from WMS Gaming a try.